studio oil is just below. Introspection is a good and useful tool. Yet often we find out something new about ourselves when we're looking outside at the world. This struck me as I looking at a group of my earlier paintings of white birch trees. 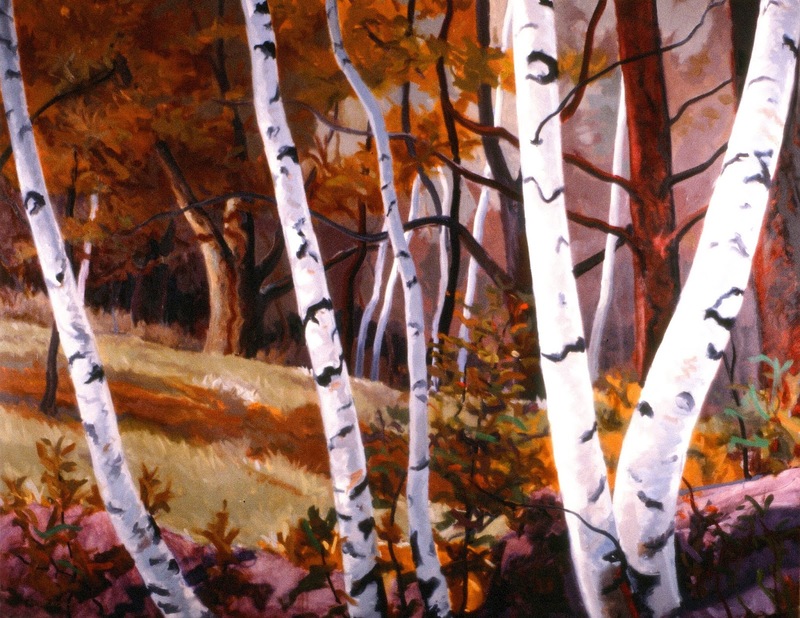 All four were based on two stands of birches in Norfolk, CT. I had set my French easel set up alongside a hilly country road. If looked to the left an older growth of birches backed up against a heavily wooded mountainside. That forest looked impenetrable and the heavy older birches were bent over. They had lost many branches in storms. Yet they stubbornly survived. You sensed there was a long history here. 25 x 20 inches, 1987. This was painted on location. From the same spot and looking to the right a very different tableau emerged. 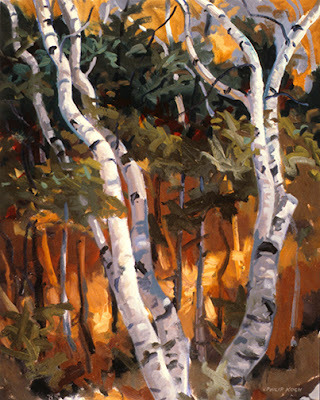 Here younger birches seemed to eagerly reach out to the world. Their thinner trunks stood more straight and erect. In back of them a farmer had mowed a pasture. 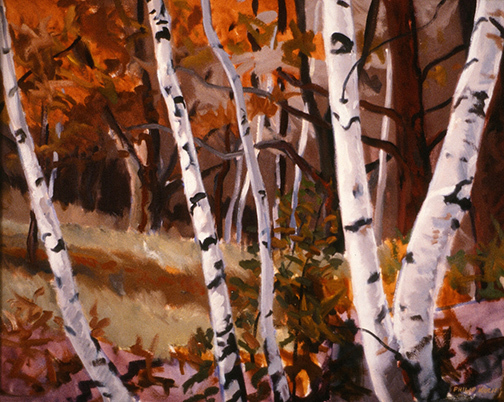 Even though I began the on-site oil on a cloudy day, the open spaces lent a sense of illumination to the scene. There was a sense of anticipation in the air. inches, 1987, the source for the larger studio oil above. 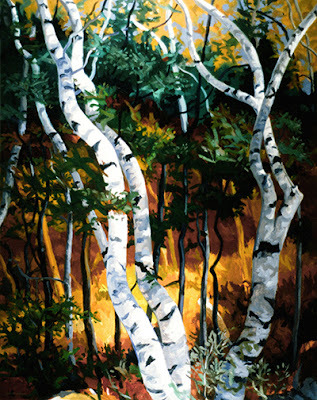 Sometimes I come upon a new source and get an itching feeling that I want to paint it. Often it feels like I already know the scene. Though I may be seeing it for the first time it strikes a familiar internal chord. For the viewer who is grabbed by a particular painting it's the same- their eyes get excited by what they're seeing, but there's also a sense that they know the scene. Who hasn't said to themselves when looking at a powerful painting "Yes, I've felt that.."
Art and music, dance and even sport- at first glance these things can seem to lack real purpose. But they are useful tools. Unconsciously we reach for them to pry the door open wider to feeling and knowing what is really going on inside ourselves.